Dave has over 25 years of experience in commercial and residential construction. He has spent the last 17 years taking care of high end homes in a resort town. Dave is very good at diagnosing problems, has a special eye with a knack for design and build. His commitment to a job well done, and customer satisfaction are top priority. When Dave has spare time he is busy volunteering in the community. 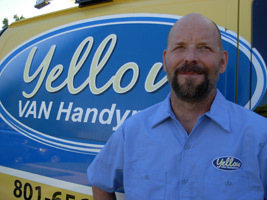 As a Yellow Van Handyman franchise owner, I am my own boss. This allows me to build & maintain lasting relationships with my members. By setting my own hours, I am able to serve my members & still have time for my family. I have over 20+ years of experience in the construction industry. Over the past 17 years I have maintained and managed high-end homes in a resort town. Working in these fields has given me the opportunity to perfect my craft & gain knowledge of all types of repair work. I want my members (customers) to fully trust & rely on me. I want to build lasting relationships with them that gives them the freedom to call me first even if the task they need done is not something that is in my normal scope of work. I want them to feel comfortable to call on me for advice about their projects. I have a reputation for high quality work, with that said my hope is to relieve some stress from their lives knowing that the job is done well. I can and will do just about any task. I have a unique ability to find and figure out problems that can arise that many others are unable to. I am a licensed & insured handyman so whether the service you need is on the interior or exterior of your home; I’m your one stop shop. I build decks & fences, fix leaks, stop squeaks, repair & replace toilets, caulk showers & sinks, install tile, clean gutters & hang doors. From kitchens & bathrooms to basements & attics, I do it all including minor plumbing & electrical work. I love referrals!! I am so grateful for the talent that God has given me, that I have used that talent wisely and have been able to bless someone so much that they would be willing to refer me. I am flooded with thankfulness & pride in my work when I am recommended to others. For me, I anticipate being able to enjoy more flexibility to serve more people that are in need. I have learned that repair requests and needs are as vast as the members, but the most unusual request was while managing a huge condo complex, a unit burned down due to flue issues. I had to go through the flue chases of each unit and inspecting the flues; cutting out wood that was too close and making sure no debris was in between the flue walls, it took months to complete. Dave Wright has done several small to large jobs. I am always more than pleased with his work. I would recommend him to friends and family.